Ethanol is a clean-burning, renewable alternative to fossil fuel. It reduces consumer impact of greenhouse gas emissions, provides American jobs and reduces dependence on foreign oil. POET is proud to produce ethanol at 28 locations. Ethanol is an essential component of the 138-billion-gallon U.S. gasoline market. When blended with gasoline, ethanol increases octane ratings, reduces production cost by volume and facilitates compliance with emissions and fuel efficiency standards. Ethanol is by far the most widely produced renewable fuel in the United States today, with approximately 13.9 billion gallons produced in 2011. It is contained in over 90% of the gasoline sold in the United States. 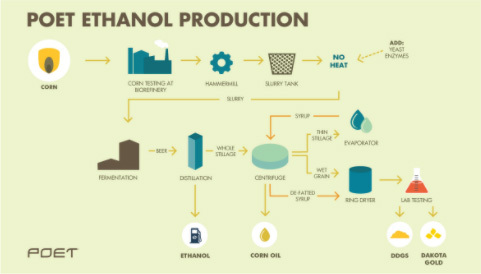 The majority of the ethanol in the U.S. is made from corn, but it also can be produced from other feedstocks such as agricultural residue, grain sorghum, wheat, barley and potatoes. Ethanol that is made from non-corn sources is called cellulosic ethanol. MILLING: The feedstock passes through a hammer mill, which grinds it into a fine powder called flour. FERMENTATION: Enzymes and water are added to convert starch into glucose, or simple sugars. Yeast is added to the mash to convert the sugars to ethanol and carbon dioxide. The mash is continually agitated and cooled until the ethanol concentration has been maximized. DISTILLATION: The fermented mash, now called beer, contains about 20% alcohol plus all the non-fermentable solids from the corn and yeast cells. The mash is pumped to the continuous flow, multi-column distillation system where the ethanol is removed from the solids and the water. The ethanol leaves the top of the final column at about 95% concentration, and the residue mash, called stillage, is transferred from the base of the column to the co-product processing area. DEHYDRATION: Alcohol is then dehydrated to 200 proof, or 100% alcohol, and the 200 proof alcohol is then pumped to a finished product tank. Prior to shipment, it is blended with approximately 2% denaturant, a gasoline-based product, to render the alcohol undrinkable and to prevent it from being taxed as a potable alcohol. CO-PRODUCTS: After removing the ethanol, we condense and dry the residue corn solids to produce distillers dried grains with solubles (DDGS), a nutritious animal feed. During the process of converting corn solids into DDGS, we can extract corn oil or proteins used to produce renewable industrial products. CARBON DIOXIDE: Some of our plants also capture the carbon dioxide released from the yeast during fermentation, which we sell to a diverse customer base located throughout the Midwest for use in food processing, water treatment, fire suppression and agriculture. Cellulosic ethanol is ethanol made from cellulose, a non-grain material/feedstock that provides the cellular structure for all plants. 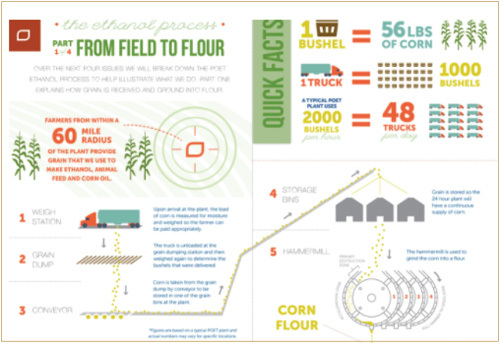 The end product – a clean-burning, high-octane fuel – is the same as ethanol made from corn. Cellulose, which provides the cellular structure for all plants, is the world's most abundant organic compound. POET has been researching and developing cellulosic ethanol technology since 2001, when we began performing bench-scale testing of our cellulosic technology at our research laboratory. 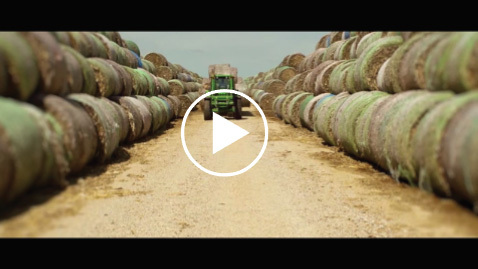 In 2008, we began producing cellulosic ethanol at pilot scale at our research center. In partnership with Royal DSM of the Netherlands, POET-DSM Advanced Biofuels opened a commercial-scale ethanol plant in Emmetsburg, Iowa – dubbed “Project LIBERTY” – in September of 2014. Project LIBERTY’s feedstock is corn crop residue – cobs, leaves, husk and some stalk. Cellulosic ethanol's potential is enormous. Department of Energy estimates have identified 1.3 billion tons of harvestable cellulosic biomass in the United States alone, which could theoretically be used to meet more than one-third of domestic transportation fuel demand. The Renewable Fuels Standard sets an annual goal of 36 billion gallons of renewable fuel by 2022, with 16 billion gallons coming from cellulosic ethanol. POET hopes to play a significant role in meeting that. Beyond the Emmetsburg, Iowa plant, we intend to build additional cellulosic ethanol plants co-located with our existing biorefineries, which we believe represents up to a one billion gallon per year opportunity. Our joint venture also intends to license our integrated technology package and offer a turnkey design, engineering and construction package to third parties. To learn more about the POET-DSM partnership and our commitment to commercializing cellulosic ethanol, visit POETDSM.com.